Police arrest 38-year old man suspected of spray painting swastikas on synagogue walls, burned holy books. Jerusalem police have arrested a man they say was likely responsible for the desecration of a Jerusalem synagogue Wednesday morning. 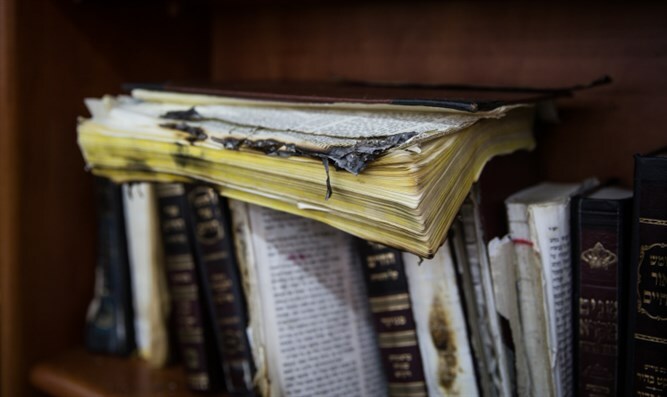 A police spokesperson reported Wednesday afternoon that authorities had taken a 38-year old man into custody hours after members of the Lelov-Nikolsburg Hasidic sect found that their synagogue in Mekor Baruch had been vandalized. “Police units in Jerusalem arrested a man, age 38, suspected of being behind the incidents in Jerusalem this morning when graffiti and damage was caused to synagogue books,” the spokesperson said. Congregants were stunned Wednesday morning to find swastikas scrawled on the synagogue’s walls. In addition, several religious books had been partially burned by the vandal. Police were called to investigate, and later found swastikas painted on nearby apartment buildings.